Understanding the ACCA Examiners report can be beneficial for students who have failed their latest ACCA but it can also be used a preventive measure and analysed before taking any ACCA exam to make sure you don’t fall into the same pitfalls as other students. After each exam sitting the ACCA will release an examiners report for every paper in the qualification. So you will see four examiners report each year per paper. Specific comments addressing each question in the same and highlighting the common mistakes made and things that were done well. It’s a free resource that is provided by the ACCA and the constructive feedback should be taken on board and will go some way into helping you pass your next ACCA exam. The general comments will go through how the exam was structured and what types of questions the students could expect. Below is an extract of the general comments made by the ACCA examiner for the F5 Performance Management paper that was sat in June 2016. 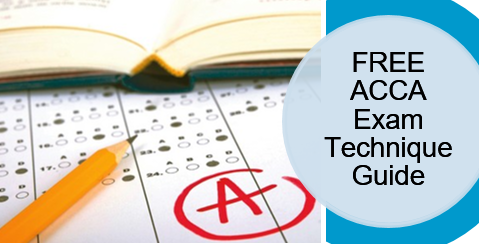 In general, performance on Section A of the exam was significantly better than on Section B. It is a good idea to do this section of the paper first to build your confidence before tackling the written questions. Make sure that you do not spend more than the allotted time on this section of the paper. It is better to move on and then come back at the end if you have time. These general tips and comments should be noted by students who will be taking the exam next time and it’s a good idea to print out or open a copy of the exam paper in question so you can align the exam paper against the examiners report. To pass the ACCA examinations, it’s beneficial to really understand why previous students went wrong and not make the same mistakes. The specific comments section on the exam report is a great to do this. The example below shows the F5 Performance Management paper from June 2016 and addresses question 1 on section b. This was a variance question examining the area of sales planning and operational variances (market size and market share). Part (a) was calculative and part (b) was discursive. This question was poorly answered. For part (a) it was necessary to first of all work out the revised sales quantities and the standard contributions for both products. This probably wouldn’t have been a huge problem but many candidates didn’t appear to know that these variances are a breakdown of the sales volume variance and instead worked out planning and operational variances for price. Others, that did know this, used actual contribution rather than standard contribution. As you can see, the examiner points out that this question was poorly answered by many students and gives the reasons why students made mistake on the variance question. By going back to the question paper, answering the question yourself and then aligning it with the examiners report you will be in a good position to pass similar questions when sitting the exam yourself. You can find the examiners guides on the ACCA F5 Performance Management paper here. And the full list of examiners reports can be found under each paper on the ACCA website.